Limehouse is a mainline railway and connected Docklands Light Railway (DLR) station located in Limehouse, east London. It is served by National Rail services operated by c2c to and from Fenchurch Street, and by the DLR to and from Tower Gateway and Bank. On the mainline railway, Limehouse is between Fenchurch Street and West Ham, and on the DLR it is between Shadwell and Westferry. The station was opened by the Commercial Railway (later the London and Blackwall Railway) in 1840 with the name Stepney. At that time, the Commercial Railway had a separate station named Limehouse one stop along the line. Stepney was renamed Stepney East in 1923, and in 1926 the other Limehouse station was closed. 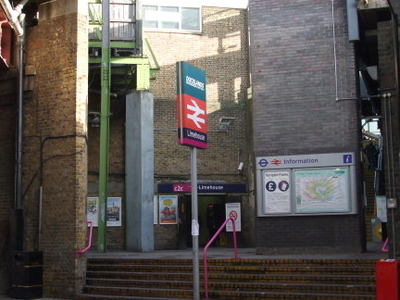 Stepney East adopted the name Limehouse in 1987, just before the DLR opened. Here's the our members favorite photos of "Railway Stations near London Borough of Tower Hamlets". 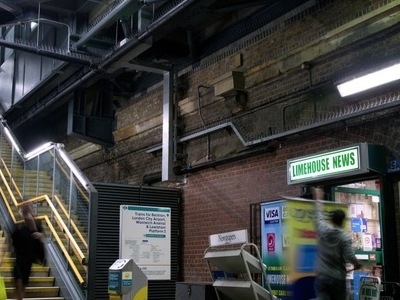 Upload your photo of Limehouse Station!